I’m the President of the Palm Beach Scouts – my son Jack is a mad keen Scout. We give out lots of our framed Certificate of Appreciation (below). 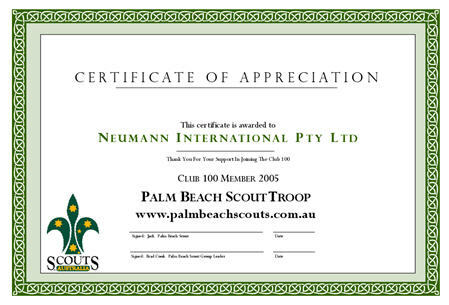 When we present the Certificate we always make sure that taped to the back of the framed certificate are 2 hooks and nails so the certificate can be quickly and easily hung on the wall of the recipient’s office or home. It would be impossible to understate the very positive impact that those tiny nails and picture hooks have – I know this sounds crazy, but the fact that we think to provide the nails and picture hooks is as important as providing the Certificate itself. What little thing can you do with your clients that will make a big difference? Little things matter. Little things can matter more than big things. “Offer a free cash wash when they visit your office for meetings”? No seriously excellent point – it’s the company equivalent of polished shoes at a job interview! Damm. Anonymous stole my joke. Note to self: must read Brendon’s blog more frequently. Was I thinking “cash wash” or “car wash”? Maybe a “cash wash” would get even more clients in!